Mill River Flood. Mixed media artwork by Nancy Meagher. 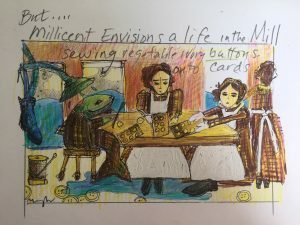 Local artist, educator and poet Nancy Meagher weaves together history, art, industry and imagination to re-create the story of the Mill River through art exhibits, community events and a forthcoming story poem featuring a “fish-eye” view of the 1874 flood. 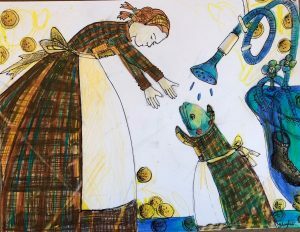 Meagher’s previous contributions to River of Words include The Fish in the Polka Dot Dress, showing a surprising perspective on the annual Source to Sea cleanup, created with children from Turners Falls. 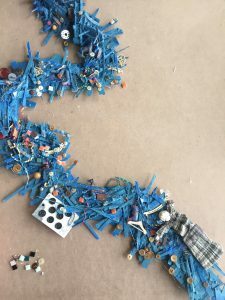 Children string Leeds Mill River Button necklaces with river water charms and vegetable ivory buttons. Bits of the Mill River squeezed into tiny glass vials using eyedroppers, trays of vintage buttons ready to be strung alongside the water filled charms, lemonade and oatmeal cookies, Hotel Bridge T shirts, oversized drawings of plaid factory dresses, Historic Northampton’s display of authentic Leeds Vegetable Ivory Buttons, shiny black Leeds mugs, a towering red brick Silk Mill, and an impressive red brick Mill owner’s mansion open to the public, set the stage for the celebration of new historic signage placards in Leeds. 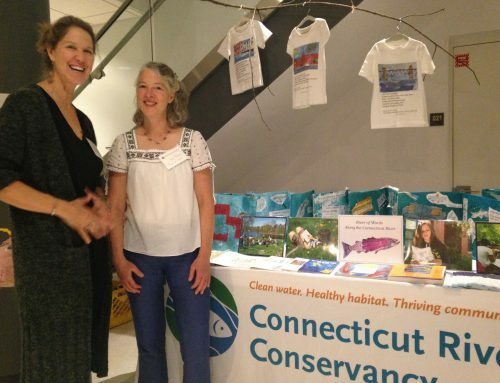 The event and signage, designed by Heidi Stevens of the Leeds Civic Association for the Leeds-Mill River Greenway Initiative, offers a closer look, through authentic photographs, of the role the river played in the history of this village. 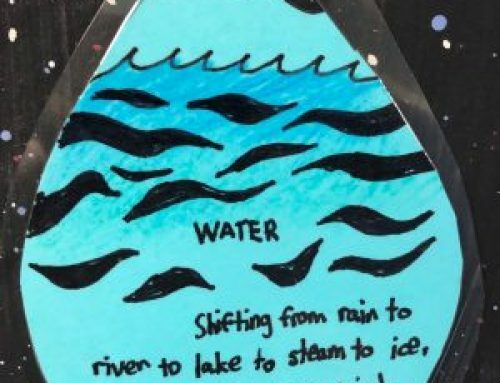 The placards tell the story of May 16, 1874, the day the Williamsburg Dam burst, sending an avalanche of water down into the unsuspecting factory towns below. In Leeds, 51 town residents drowned. Night and day, the bronze placard adjacent to Hotel Bridge spells out their names. 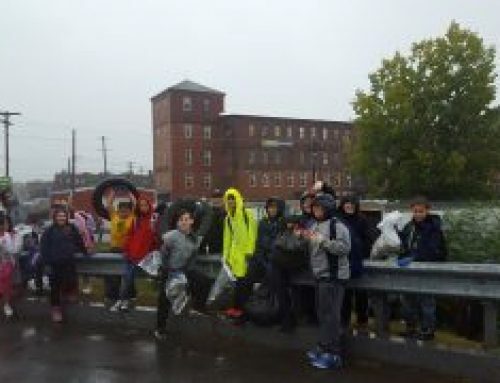 How to tell children the story of the Mill River Flood? Plaque, placards, and a tumbling Mill River surround the children of Leeds with a story that is difficult to tell. In the upcoming River of Words book, “Millicent is Magnificent” by Nancy Meagher, an insecure brook Trout named “Millicent” has offered to try. 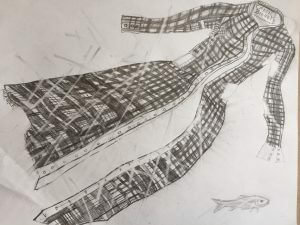 Plaid dress floating. By Nancy Meagher. “…. But, where are the Mill girls? And, where is the Mill? Where are the Mill boys, the bustle, the thrill? The faraway places, the Fashions…..
“The bathtub and boot that Millicent finds in the river are constant companions.” From Millicent the Magnificent by Nancy Meagher. If the residents of Leeds could tie a great big bow around their river, they surely would. Instead, they can wear a tiny bit of it, reminding them of their vibrant community and commitment to their history. Stay tuned for “Millicent is Magnificent, A Leeds Mill River Story Poem,” dedicated to Williamsburg Historian Ralmon Black, for his gracious loan to Historic Northampton of a woman’s black boot found in the mud, days after the Williamsburg Dam collapsed on May 16, 1874. 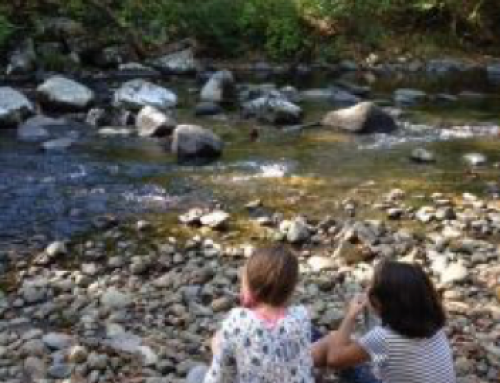 Curious to learn more about the Mill River history?